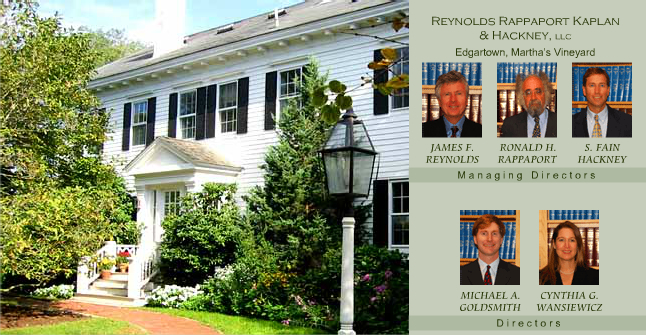 Attorneys at Reynolds, Rappaport, Kaplan & Hackney, LLC, are located in Edgartown on Martha’s Vineyard. We are noted for our professionalism, commitment to excellence and years of dedicated experience combined in a trusted and respected law firm with an outstanding reputation on the island. Our attorneys serve as Town Counsel to five of the island towns, Aquinnah, Chilmark, Edgartown, Oak Bluffs and West Tisbury, as well as the Martha’s Vineyard Land Bank Commission. The firm is committed to the Island, its ideals and its people. Contact us about your legal situation in the areas of real estate law, trust and estate planning, corporate and business law, municipal law and civil litigation.